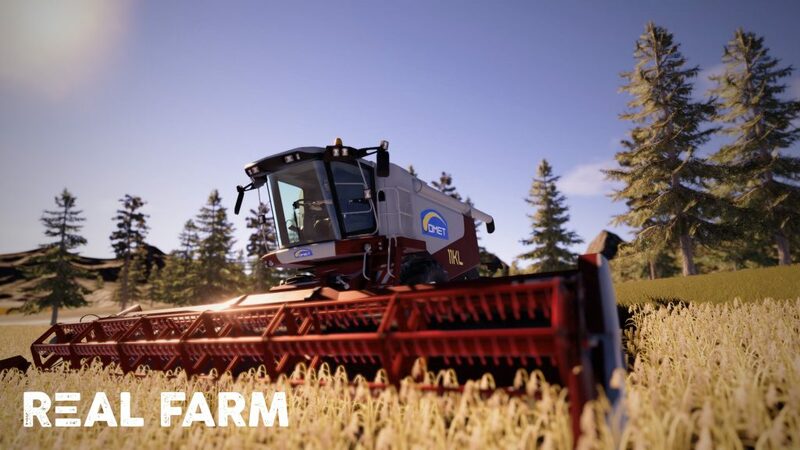 Earlier today, SOEDESCO (a Netherlands-based video game publisher) released a healthy dose of information on their upcoming farming simulation game. Formerly referred to as Real Farm Sim, the game is now titled Real Farm (dropping the “Sim” component) — likely an effort to both simplify the name and perhaps avoid thoughts that the game is a knock-off of Farming Simulator, as there have been games in the past that have nearly duplicated that series’ style, down to the lettering on the box art (I’m looking at you, Professional Farmer). SOEDESCO released a gameplay trailer showcasing in-engine footage of the game in action, and finishing up with a release date for PC, PS4, and Xbox One: October 20, 2017. Name change aside, the trailer for Real Farm maintains the look and feel of the screenshots that we have seen to date. The graphical quality is really quite impressive, and in my opinion is far better than that seen in Farming Simulator 17. The gameplay shown in the trailer appears to be relatively standard fare for a farming game, as it showcases the seeding, spraying, growing, and harvesting of crops, as well as some minor glimpses into the raising of animals. Based on what’s shown in the trailer, players will be able to plow fields, plant, fertilize (using manure and/or chemicals) and harvest crops, mow grass, and raise animals. The trailer shows the seeding and harvesting of corn and wheat, but I fully expect that there will be additional crops available in the game. In terms of animals, we see cows, sheep, and chickens in the trailer, however there’s always the possibility that additional animals may exist in the game as well. The trailer seems to confirm that there will be no sign of licensed equipment brands in the game. While this isn’t exactly a deal-breaker (the tractors will drive the same way whether or not they’re official brands) it does take something away from the realism of the game. That being said, it likely isn’t fair to expect a genre newcomer to tick all the boxes that an established series like Farming Simulator does, particularly when we don’t know the nuances of the licensing agreements that GIANTS has entered into (perhaps they have exclusive rights to using those brands in a game?). In any case, the equipment models look nice, and seem to be fairly realistic representations of their real-life counterparts. While the “free mode” sounds like typical farming simulation, the mention of a career mode caught my attention. It will be very interesting to see how this mode is delivered, and if there are multiple options for farms to buy (in terms of what they might include for land, buildings, equipment, and animals) when you reach that point in your career, and how expansion of one’s farm will be handled. It also begs the question — will there be an “end game” of sorts, or is the ultimate goal of the mode to grow one’s farm in a similar fashion to free mode? I’m definitely curious to learn more about the mode, and see how it plays out. 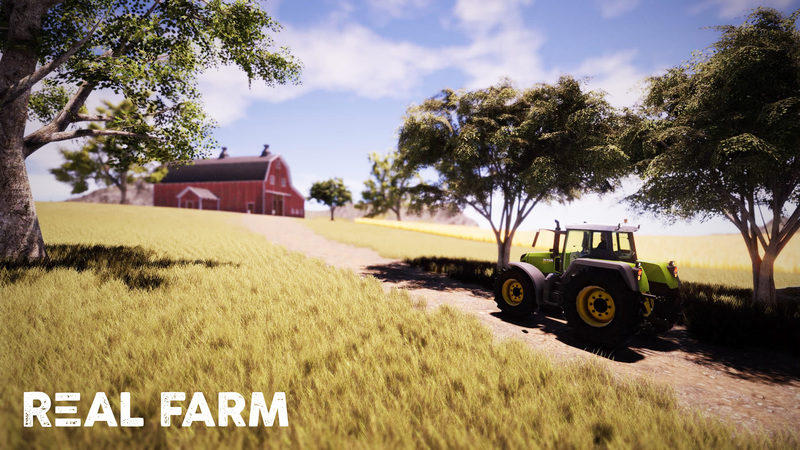 Providing more concrete goals could provide newcomers to the genre with a much-needed introduction to farming, and a gentler learning curve than has been seen in Farming Simulator. Farming games can often be too open-ended, and without any clear responsibilities being set out, players sometimes don’t know what they should be doing. Real Farm‘s career mode may just remedy this. The press release provided by SOEDESCO also contained some other snippets of information on the game, including reference to “buying and selling in a real time economy,” “pick-up-and-play controls and a comprehensive tutorial,” and the ability to “drive and maintain a massive array of farm vehicles and machinery.” Of these, the last one particularly intrigues me, as it seems to indicate that players will be able to perform maintenance activities on their equipment, and it may even break down from time to time. This is a feature that is often sought after in farming games, and if Real Farm can deliver it, that would definitely serve to set it apart from other games in the genre. Some things about the game do remain a mystery. Will players be able to create and use mods? Are there multiple maps to farm on? Will there be any weather or seasonal effects in the game? Hopefully we will get answers to some of these questions before the game’s release in October. As noted in my article on transparency in iterative game development, GIANTS Software made good use of things like fact sheets and developer blogs in providing potential players with information on the game’s features and functions. I’m hoping we’ll learn more about some of the key aspects of Real Farm as we get closer to its release, particularly given that it purports to be focused on heightened realism and we haven’t seen a great deal of supporting evidence for that to date. Overall, I’m encouraged by the sheer prettiness of the game; the trailer and screenshots look beautiful. The fact that it looks like it might be incredibly similar to Farming Simulator in terms of gameplay is neither surprising nor worrying, in fact it’s a positive if the two games play similarly. The mention of vehicle maintenance is encouraging, and the presence of a career mode is incredibly intriguing. To be frank, when Real Farm was announced, I was skeptical of its ability to compete with Farming Simulator for a place in the simulation market. Now, the more I learn about it, the more I want to play it — and that’s a great position for a game to be in.